A 20-year-old normotensive man with intact coagulation who presented with severe headache after weight lifting. A, Indeterminate NCCT demonstrates an acute right parietal IPH with surrounding edema. There is no evidence of IVH or SAH (not shown). B, CTA source image demonstrates a tangle of abnormal vessels in the anteromedial aspect of the IPH with an associated enlarged cortical vein draining to the superior sagittal sinus, consistent with an AVM. C, CTA MIP image in the sagittal plane demonstrates a tangle of abnormal vessels in the right parietal lobe with an enlarged feeding artery arising from the right middle cerebral artery, consistent with an AVM. This lesion was confirmed with conventional angiography. 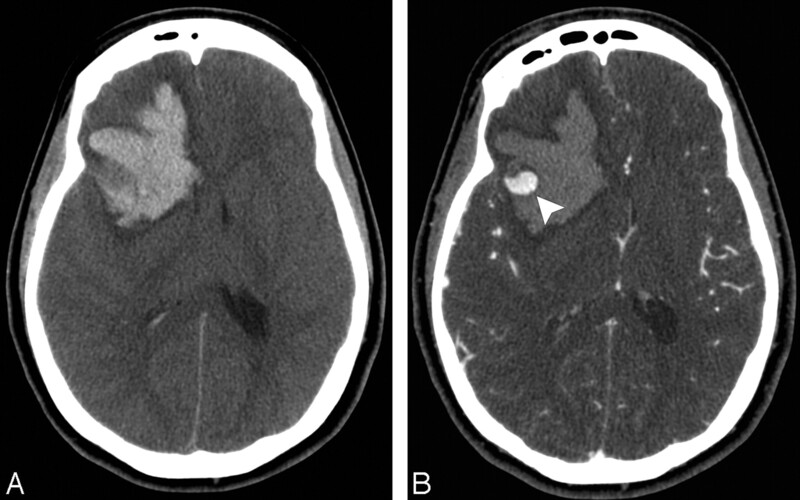 A 37-year-old normotensive man with intact coagulation who presented with acute onset of right hemiparesis. A, High-probability NCCT demonstrates an acute left frontal IPH with a peripheral filling defect and associated calcifications (arrowhead). There is no evidence of IVH or SAH (not shown). B, CTA source image demonstrates a tangle of abnormal vessels in the lateral aspect of the IPH, consistent with an AVM. C, CTA MIP image in the coronal plane demonstrates a tangle of abnormal vessels in the left frontal lobe with enlarged feeding arteries arising from the left middle cerebral artery and superficial venous drainage to the superior sagittal sinus, consistent with an AVM. This lesion was confirmed with conventional angiography. A 22-year-old normotensive woman with intact coagulation who presented with altered mental status. A, Indeterminate NCCT demonstrates an acute right fronto-temporal IPH with associated IVH and surrounding edema. There is no evidence of SAH (not shown). B, CTA source image demonstrates an arterially-enhancing structure in the lateral aspect of the IPH measuring 13 mm (arrowhead), consistent with a right middle cerebral artery aneurysm. This lesion was confirmed at surgery. A 48-year-old normotensive woman with intact coagulation and a history of oral contraceptive use who presented with worsening headaches followed by a generalized tonic-clonic seizure. A and B, High probability NCCT demonstrates an acute left temporal IPH with associated hyperattenuation in the left transverse sinus evidenced in the coronal reformation (arrowhead). There is no associated IVH or SAH. There is also hyperattenuation within the left vein of Labbe (not shown). C, MIP image after calvarial segmentation of a CT venogram performed immediately after the CTA demonstrates nonopacification of the left transverse and sigmoid sinuses (arrowheads), with adequate opacification of the contralateral venous sinuses, consistent with dural venous sinus thrombosis. A 25-year-old normotensive woman with intact coagulation who presented with severe headache after recent cocaine use. A, Indeterminate NCCT demonstrates an acute left parietal IPH with surrounding edema. There is no evidence of IVH or SAH (not shown). B, CTA MIP image in the sagittal plane demonstrates multiple areas of segmental narrowing in the anterior cerebral and pericallosal arteries bilaterally (arrowheads), consistent with vasculitis. C, Arterial phase of a catheter angiogram in the lateral projection following contrast injection of the left common carotid artery demonstrates multiple areas of segmental narrowing in the left anterior cerebral and pericallosal arteries (arrowheads), consistent with vasculitis. A 53-year-old normotensive woman with intact coagulation who presented with severe headache, right-sided weakness, and worsening aphasia. A, Indeterminate NCCT demonstrates an acute left temporal IPH with associated IVH and surrounding edema. There is no evidence of SAH (not shown). B, CTA source image demonstrates nonopacification of the distal supraclinoid segments of the internal carotid arteries and M1 segments of the middle cerebral arteries bilaterally, with numerous associated lenticulostriate collateral vessels (arrowheads), consistent with Moyamoya disease. C, Arterial phase of a catheter angiogram in the lateral projection following contrast injection of the left common carotid artery demonstrates complete occlusion of the distal supraclinoid segment of the left internal carotid artery and M1 segment of the left middle cerebral artery, with a “puff-of-smoke” appearance produced by an extensive network of lenticulostriate collateral vessels (arrowhead), consistent with Moyamoya disease. 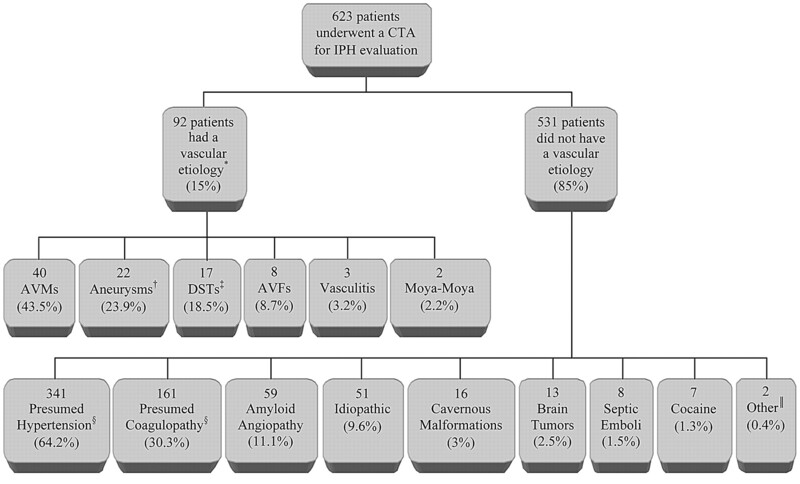 Summary of final IPH etiologies in our emergency department patient population. *Eighty-nine of 92 cases were detected on MDCTA (96.7%). †Includes 18 saccular aneurysms as well as 2 iatrogenic and 2 mycotic pseudoaneurysms with intraparenchymal rupture. ‡Includes 15 dural venous sinus and 2 isolated cortical vein thromboses. §127 patients had both hypertension and impaired coagulation (23.9%). Forty-two patients were discharged with a new diagnosis of hypertension. ‖Includes 1 IPH due to a distal embolic hemorrhagic infarction and 1 IPH due to posterior reversible encephalopathy syndrome. DST indicates dural sinus thrombosis. Note:—PPV indicates positive predictive value; NPV, negative predictive value; IPH, intraparenchymal hemorrhage; CTA, CT angiography. * Fifty-one vascular lesions were confirmed by conventional angiography, 54 during direct surgical evaluation of the hematoma cavity and pathologic evaluation of the surgical specimen and 4 at postmortem examination (33 vascular lesions were confirmed by >1 type of examination but counted only once for the purpose of this analysis). Note:—HTN indicates hypertension; n/a, not applicable; IVH, intraventricular hemorrhage. * Includes 2 false-positive CTAs. † From univariate analysis with the Pearson χ2 test. ‡ Independent predictor in multiple variable logistic regression analysis. § Group 1: 21 AVMs, 8 aneurysms, 7 dural sinus thromboses, 3 AVFs, 1 case of vasculitis, and 1 case of Moyamoya disease; group 2: 15 AVMs, 9 dural sinus thromboses, 8 aneurysms, 4 AVFs, 2 cases of vasculitis, and 1 case of Moyamoya disease; group 3: 5 aneurysms, 4 AVMs, 1 AVF, and 1 dural sinus thrombosis. ‖ Includes patients with either HTN and/or impaired coagulation. § Includes patients with either HTN and/or impaired coagulation. Note:—No. indicates the number of patients; IC, impaired coagulation. * Includes 1 false-positive CTA.